nking about these issues in the more rural context of Vermont. Through comparative concept mapping of lead in urban and rural systems we were able to dig into policy implications, stakeholder analyses, and remediation approaches. Professor Brabander also brought his portable XRF to measure lead content in soil and compost samples that Middlebury students collected. This provided a third measure of lead content (other readings taken from a rented handheld XRF as well as provided by Middlebury’s CHEM 311 class GFAAS measurements) to compare the results across these three techniques. 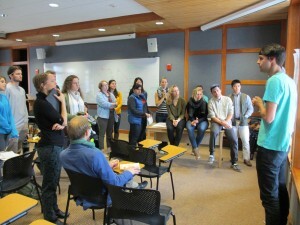 This peer-to-peer exchange of ideas across colleges was a great compliment to the collaborative teamwork of ENVS 401.